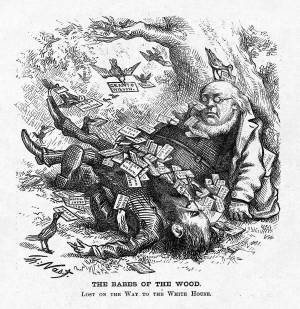 With this cartoon, Nast appears for the first time to concede that the end for Greeley and his seldom pictured vice-presidential designate B. Gratz Brown was within view. This pictorial adaptation of an English children's story concerns two babes who had been left to die in a forest so that a wicked uncle might secure their inheritances. In the original, they are covered with leaves by "friendly Robin Redbreasts" in a vain attempt to keep them warm.